KARIYA, Japan, Sept. 14, 2018 /PRNewswire/ -- DENSO Corporation today announced that it will exhibit at the 25th ITS World Congress Copenhagen 2018 in Denmark (September 17 to 21, 2018) on the theme "DENSO's Technologies and Efforts to Support the Future System of Mobility." DENSO is committed to providing new values, such as safe, convenient traveling and efficient logistics, toward the future of mobility based on its Long-term Policy 2030. In addition to its sophisticated in-vehicle technologies, DENSO has been developing technologies for the social infrastructure, as well as cloud and data communication technologies for connecting vehicles with other things. 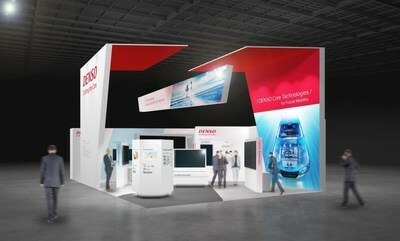 For the cloud, DENSO will exhibit technologies for Mobility as a Service (MaaS) and data analysis technologies using quantum computers. For connecting vehicles with the cloud, DENSO will introduce data communication technologies for efficiently collecting image data captured by dashcams. For inside the vehicle, DENSO will demonstrate its next-generation driver status monitor for detecting potential problems and expressions of the driver, and its blockchain application to prevent hacking of vehicle software and data. DENSO's technologies and products help reduce traffic accidents. Based on these technologies, DENSO will continue to improve mobility for all people around the world.